Dr. Callaham has raced the ex-John von Neumann, ex-Richie Ginther, ex-Bill Sherwood car #0680 in historic races for decades now. Callaham at Sears Point in the 1980s. Note added hood scoop to feed the V12 engine's six carburetors. All three 500/625 TRC's equipped with V12s have this modification. 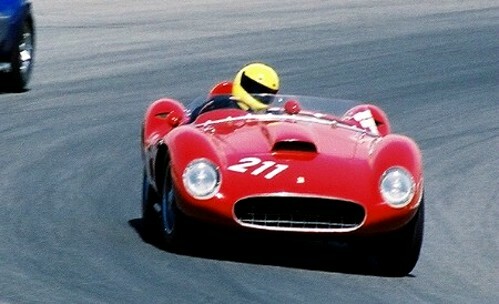 Collector Bruce Meyer shows #0672, the sister 625TRC also imported and raced by von Neumann, at SoCal Concours events. Callaham rounds Turn 5 at Laguna Seca at the 2000 Monterey Historics.